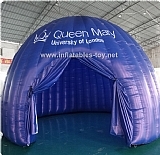 Hemisphere Dome Tent Outdoor Retiring Room Office Workshop is very convenient and flexible which is widely used as inflatable party tent,inflatable event tent,inflatable advertising tent, inflatable sports tent, inflatable exhibition tent, inflatable wedding tent, inflatable warehouse tent, rest room tent and so on. 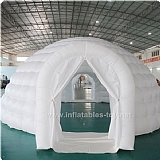 Our inflatable igloo dome tent is very easy to be installed and take down to move around,it is much cheap than solid building. 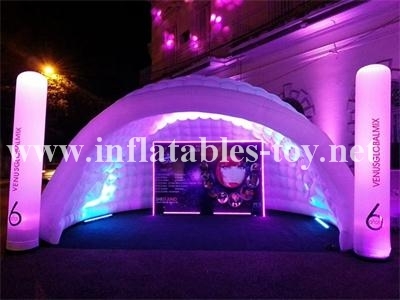 Also our inflatable igloo dome tent can be vey beautiful,you can install lights inside to make it be a prismy lighting tent. 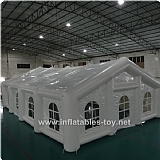 Inflatable air tent can be made any size as you need, for example, we can make party tent to hold from tens people to thousand people. 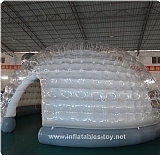 All of our inflatable igloo dome tent is very safe, even tent is broken by accident, it will fall down very slowly, so people inside have enough time to get out,and also you can repair it during this time. 11. Customer Made: available, like size, color, logo and so on, we also can offer the design as your special need.Can be made into any shape and any size so it is used in various ways. Installation of lighting effects will be very nice!